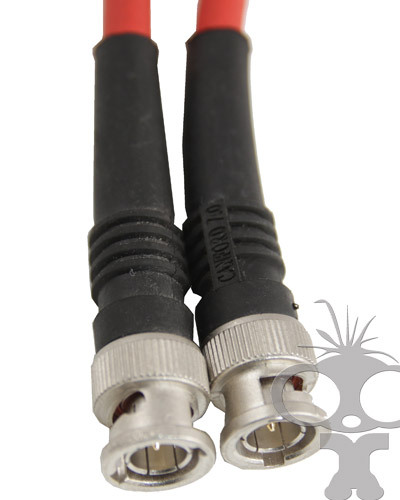 The standard video interconnection cables for pro video gear - SDI cables. Why settle for dodgy HDMI cables falling out of your camera gear when you can rig up with solid coax cables that stay locked in place? Available for hire we have a range of 75 ohm BNC coax HD SDI video cables for a professional video cameras and accessories and for connecting SDI monitor. These coax cables feature a locking BNC end ensuring that they stay firmly connected to your equipment. Co-axial cables feature a shield to help isolate noise from video signals. We have coax cables available in various lengths to suit dolly connections or jibs. if you only have HDMI connections on your camera then we suggest you look at our HDMI-SDI converters to allow you to gaffer or lock off your HDMI and then attach a monitor to your SDI coax cable instead. We have a great SDI monitor that is great on set for focus pulling or as a directors monitor. If you really don't like cables between your camera and video gear then why not try our Teradek Bolt zero-delay wireless video sender system instead. This device removes the need for any cables to your directors monitor and coupled with the Redrock micro wireless follow focus system you can focus pull for jib and dolly shots with ease.